Shying away from the general humdrum of Bandra in the quiet lane called Waroda Road is Café Condi, whipping up both sweet crêpes and savoury galettes in a cosy place. Getting to Café Condi will require a small walk from a nearby lane where you will have to abandon your transport. But walking always helps work up an appetite so no complaints there. Located right next to Imbiss, you will spot a cool-looking, double-storey eatery. They have a seating for about six people downstairs and a mezzanine floor with three tables and a cosier feel (be careful on the steep staircase though). With mood lighting and aesthetically done interiors, you might end up ordering extra just to spend some more time here. Oh! And they also have small mattress situation outside the café for between meal breaks, and some Instagram picture if you choose to. They have a short and sweet menu which can still prove to be challenging when you finally get down to order. The vegetarians can either go for the spinach, mushroom and cheese option or their pesto, bocconcini & balsamic tomatoes variant which is what is what is inching closer to be a crowd favourite. For the meat eaters, goa sausages (also the owner’s favourite) and smoked salmon with lemon cream cheese are recommended. After a round of savouries, binge on a Nutella banana crêpe, or a poached pear, Danish blue cheese, walnut & honey crêpe. Their vegetarian crêpes are priced at INR 200, non-vegetarian variants at INR 300 and the sweet ones range between INR 100 and INR 150. 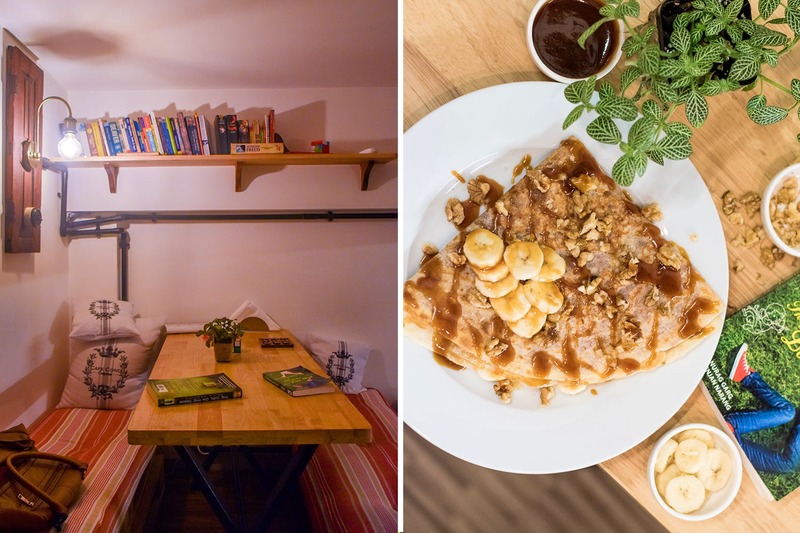 Laze around in this peaceful eatery while you look over colourful Bandra houses, challenging each other in a game or two (they have board games).